★ LARGEST PR 9 GIG! 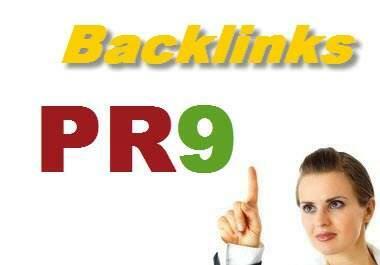 ★★ 25 x PR9 Highest Authority Domain Backlinks 100% manually build to your website to help it dominate Google. Yahoo, HP, Adobe, Opera, AOL, etc. - will link back to your site and increase its Authority and Google Love!I will manually create 25 top quality Angela & Paul style backlinks (web 2.0 profiles, social networks, edu, forums) from the "Planet's Biggest PR9 Websites". This Google friendly seo helped 100's of sites rank high in search engines and get more traffic. Get this PageRank 9 "link juice" as well! This Google friendly seo helped 100's of sites rank high in search engines and get more traffic. Get this PageRank 9 "link juice" as well! Yahoo * Flickr * Adobe * AOL * Vimeo * Mozilla * HP * Disqus * Opera * Moodle * Xing... A Total of 25 Unique, Best Quality and Most Trusted Web 2.0's with Huge Page Rank and Authority. Order Now!